Hi from bright and sunny San Diego. Or so I'm told. I've been inside a 5G standards meeting for the last day or so. The dispute between Qualcomm and Apple over technology at the heart of cellphones will come to the forefront on Friday, when opening arguments are scheduled before the U.S. International Trade Commission. Why it matters: It's a battle of two tech giants accustomed to holding sway over their business partners. That said, the ITC case is just one part of a broader legal fight taking place in courts across the globe, involving claims of everything from breach of contract to patent infringement. What Qualcomm wants: Qualcomm is looking for what's known as an exclusion order, which would keep Apple from importing certain iPhones — those with Intel chips rather than Qualcomm ones. What Apple wants: Apple is hoping that the ITC will find that Qualcomm's patents are invalid, not used by Apple products or are otherwise unenforceable. More than anything, it doesn't want to see the commission issue any kind of order banning iPhone shipments. It maintains that Qualcomm's royalties, calculated as a percentage of the total phone, are unfair. 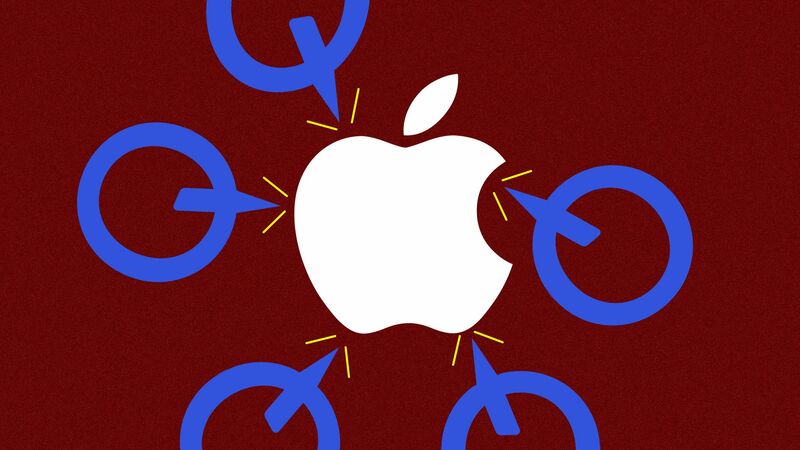 "For many years Qualcomm has unfairly insisted on charging royalties for technologies they have nothing to do with," Apple said when it sued Qualcomm earlier. The bigger dispute: As mentioned, the Qualcomm-Apple fight has been an ongoing issue. Apple sued Qualcomm in January 2017, days after an FTC complaint, seeking $1 billion in damages. Qualcomm has also sued Apple and several Apple contract manufacturers for not living up to their royalty agreements with Qualcomm. And it has brought patent suits. In addition to this case and another before the ITC, it has sued Apple in Germany and China. Qualcomm also has faced antitrust inquiries from jurisdictions around the globe, including China, Korea, Japan and Europe. Qualcomm accuses Apple of agitating for many of these probes, in what it says was a violation of an agreement by Apple not to challenge Qualcomm's intellectual property. The bottom line: The stakes are high for both companies — for one thing, if ITC finds against it, Apple could see supplies of the iPhone disrupted. While Apple uses its own mobile processors, it has historically relied on Qualcomm for modem chips. Apple has already shifted to using Intel modems for some iPhones and may up this in the future. However, Apple is still likely to eventually need a license to Qualcomm's considerable patent portfolio. FCC Chairman Ajit Pai said at an Axios event on Thursday morning that competition regulators should weigh the increased dominance of Google and Facebook over the digital ad market. The big picture: While Pai and the FCC didn’t vet the AT&T-Time Warner deal, these comments line up with the telecom giant’s arguments in its court victory over the Justice Department. Pai’s comments may indicate a broader sympathy with the telecom industry’s arguments that consolidation is the cure, at least in part, to their struggles to compete with Silicon Valley. This is particularly noteworthy as more media and telecom companies explore new vertical integration deals as a result of the court’s approval of AT&T’s merger. Snapchat's parent company is finally rolling out Snap Kit, its rumored suite of tools that lets developers plug in the ephemeral app's data, and vice versa, Kia Kokalitcheva and Sara Fischer report. Initial third-party apps with Snap Kit access include Postmates, Tinder, Poshmark, Eventbrite, Pandora and Giphy. Pandora already describes how a user can share music via Snapchat. Why it matters: Snap says its approach to letting outside developers into its network is much more user privacy-focused than fellow social media companies, but it will still have to prove that it's learned from early mistakes. It will only share a user's display name and avatar, and no other identifiable information or friend lists. Snap will disconnect any third-party app if a user hasn't used it in 90 days (Facebook recently instituted a similar policy following the Cambridge Analytica scandal). All third-party apps will go through a human review and approval process. Snap has a history of building products and features that don't rely on collecting as much user data as some other online services, Katherine Tassi, Snap's deputy general counsel for privacy and product, pointed out in a recent interview with Axios. The tools range from adding info from other apps into Snapchat's camera to embedding public Snapchat Stories into websites and other apps. But, but, but: Snap may be selling itself as the user privacy-conscious social media company today, but just a few years ago, it got in trouble for misrepresenting to users its data retention practices, settling these charges with the FTC in 2014. In December 2013, hackers published a database of 4.6 million Snapchat usernames and numbers after the company was alerted to a vulnerability by a security researcher. More: Read their full story here. Apple is moving ahead with plans to limit the ability to access data from an iPhone via its charging port, a move that has drawn some concern from law enforcement. What's happening: A new USB Restricted Mode will change the phone's Lightning port from a data-and-charging port to a charging-only one an hour after the phone is locked. Why it matters: This severely limits the usefulness of the port as a means to gain access to information on a locked iPhone — but also restricts hackers from using the port for malicious purposes. Apple's standpoint: The use of the Lightning port to access a locked phone had become more than just a tool for law enforcement, but also a potentially broader security vulnerability. "We’re constantly strengthening the security protections in every Apple product to help customers defend against hackers, identity thieves and intrusions into their personal data," Apple said in a statement on Wednesday. "We have the greatest respect for law enforcement, and we don’t design our security improvements to frustrate their efforts to do their jobs." Law enforcement's position: Because Apple tightly restricts access to the iPhone for anyone other than its owner, law enforcement agencies are constantly looking for ways into a device for which they don't have a password. The Lightning port had proved a popular means for those looking to hack them — and this includes legal authorities. The bottom line: While the existence of USB Restricted Mode in test builds had been previously noted, a New York Times report earlier Wednesday included Apple's comments as well as concerns from law enforcement — and that it could spark a broader debate. Go deeper: Read more here. Comcast CEO Brian Roberts. Photo: Drew Angerer/Getty Images. As expected, Comcast made its bid for 21st Century Fox, one day after a federal judge gave the AT&T's Time Warner deal a thumbs up. Later in the day, Comcast officials told analysts they expect its $65 billion deal can win regulatory approval. What's next: Will Disney raise its mostly stock bid, which was $13 per share less than Comcast's all-cash offer? The big question: Whether Comcast is able to outbid Disney in the end. Sources say Fox's Rupert Murdoch would rather have Disney's Bob Iger as a deal partner than Comcast's Brian Roberts, with whom he has personal tension. "Murdoch will do everything he can to deliver these assets to Disney short of something that would be so uneconomic that it would be a big embarrassment and would question any form of integrity they have to shareholders," says Todd Klein, partner at Revolution. The E3 video game trade show wraps up in LA. Uber has hired tech veteran Daniel Danker as head of driver product. Danker previously worked at Facebook and Microsoft as well as a stint as chief product officer for Shazam. The head of HP's computer business, Ron Coughlin, is leaving to become CEO of Petco, per MarketWatch. WeWork had a $1.5 billion revenue run rate through the end of Q1, according to a memo sent early this morning to company employees and obtained by Axios. With the FCC repealing its net neutrality provisions, Washington State has signed into law its own protections. Twitter unveiled a new format for highlighting coverage of timely events, its latest in a series of attempts to be more of a destination when news breaks. The White House is hoping to strike a bargain with Congress after the Senate passed a bill aimed at thwarting President Trump's deal with ZTE. Fortnite for the Nintendo Switch was downloaded 2 million times in under 24 hours, according to The Verge. OK, this is not nice. Funny, but not nice.